Wine and alcohol labels are very important to the product. Unlike other consumer products, purchasing behavior of alcoholic beverages is affected by the information on the label. People tend study the label more deeply, noticing the quality of label, year of manufacture, alcohol content and many more. The maturity of wine is at times determines by its age. For this purpose a lot of care and attention is given to the quality of the label. Wine and liquor bottle labeling is therefore a delicate and important process in the overall manufacturing chain of the products. The same caution applies to beer packaging. 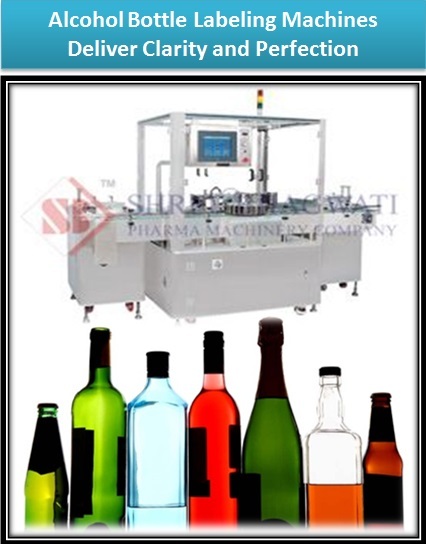 Wine bottle labeling machines are used to deliver accurate and neat labeling of the bottles during manufacturing. This is an important planning element before choosing the beer bottle labeling machine for your production facility. The orientations of the bottle as well as the size of the bottles are critical in determining what model of equipment to be used. Mainly these are conditions such as the humidity in the air and the prevailing temperatures. These may affect the quality of application and ultimately the appearance of the product. Alcoholic beverages manufacturers tend to have big labelers with lots of information and color for their products. This is an important consideration while purchasing the beer and spirits bottle labeling machines. The machine must be able to accurately place it on the bottle in the right orientation and on the spaces provided. The labeling machine must have the ability to match with the production output and demand levels. Liquor bottle labelers are purchased with the end in mind in terms of the future output as the production unit grows and expands. Design engineers must accurately determine the delivery method of the labels, core size of the label roll and orientation of the machine with the product. When these factors are put into consideration, efficiency of the labeling process is enhanced. The equipments are equipped with advanced control systems that add onto the efficiency and effectiveness of the operation. Flexibility of application allows the machine to be able to apply labels of different sizes of liquor bottles without requiring too much recalibration. The equipments are developed with high grade stainless steel, which is strong and hygienic during processing. Advanced and automated height adjustments enable easy machine control and operation as well as accurate label positioning. Liquor bottle labeling machines continue to be advanced in technology and features, with the aim of making them affordable and efficient in operation. These equipments are also applicable in uses such as cinder bottle labeling and can be used as fruit juice bottle labeling machines.